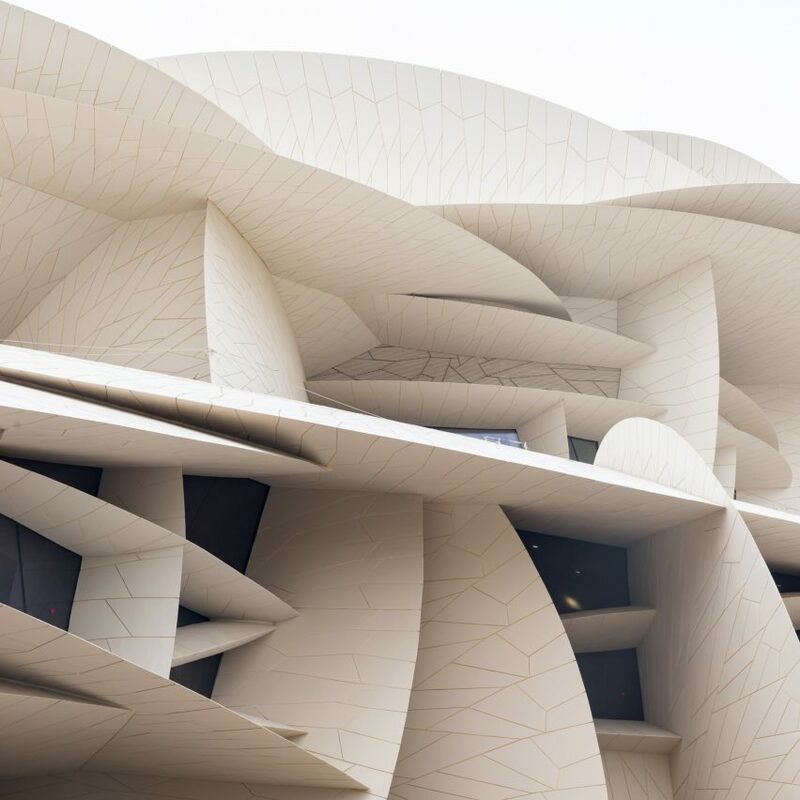 A series of colliding discs form the external shell and define the internal programme of Atelier Jean Nouvel‘s National Museum of Qatar, which is based on a mineral formation called the “desert rose”. The project led by Pritzker Prize-winning architect Jean Nouvel is located on a prominent site within a newly developed civic quarter that connects it with other cultural institutions including I M Pei’s Museum of Islamic Art. 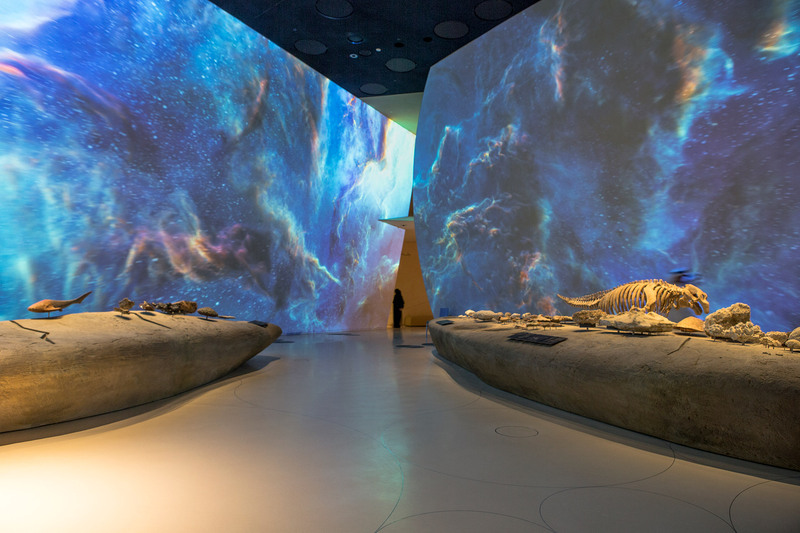 More than a decade in the making, the National Museum of Qatar is designed to tell the story of the country’s history and its ambitions for the future. 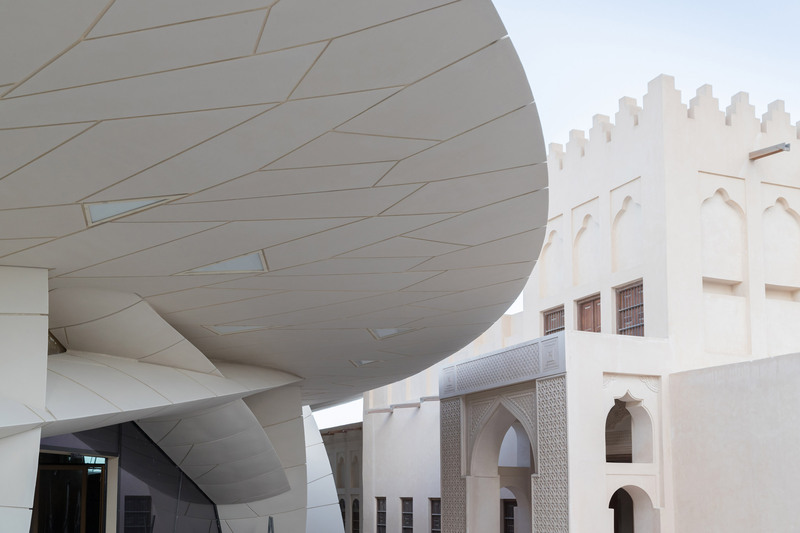 The building’s dramatic shape is inspired by the desert rose – a mineral formation created when minerals crystallise below the surface of a salt basin into an array of flat plates resembling rose petals. A steel frame that spans an insulated waterproof superstructure supports the interlocking discs, which are clad in a glass-fibre reinforced concrete with a sandy hue that evokes the desert landscape. Sections of the building’s shell protrude outwards to shade areas of a central courtyard, and to protect the interiors from direct sunlight. Gaps between the discs accommodate frameless glass openings that provide views towards the courtyard, the museum’s gardens and the nearby Doha Bay. Nouvel explained that the radical form seeks to express Qatar’s progressive cultural outlook and technological capabilities, which have contributed to its rapid expansion in recent years. 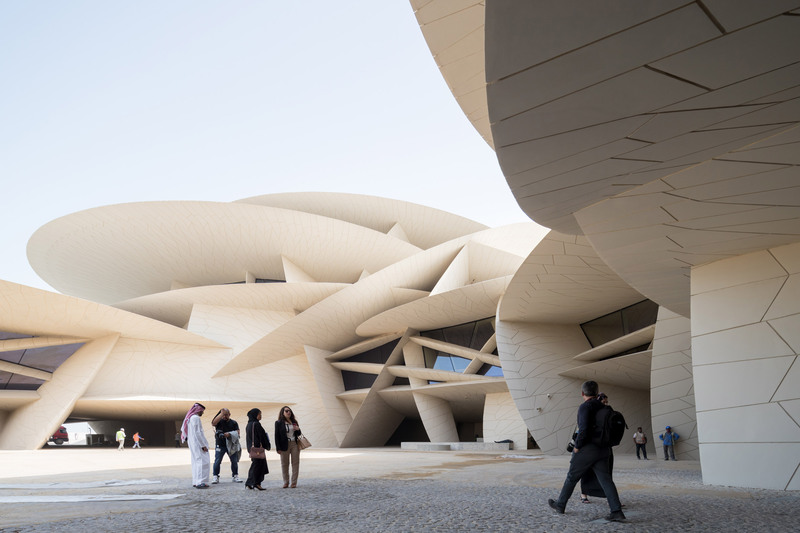 “It’s important to consider that architecture is a testimony of time and the museum is a testimony of this time in Qatar, which is a very powerful period,” said the architect. 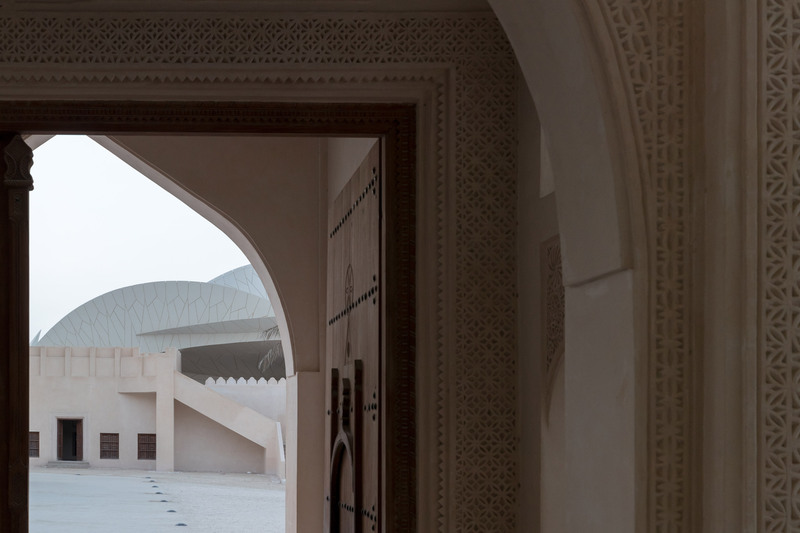 The museum’s 52,000-square-metre floor area enfolds the early 20th-century palace of Sheikh Abdullah bin Jassim Al Thani, which has been extensively renovated and integrated into the visitor experience. The building’s plan forms an elliptical circuit that leads visitors through a sequence of galleries occupying the irregular spaces between the interlocking geometric planes. The galleries surround a central courtyard that references the traditional Baraha where travellers would unload their merchandise. The courtyard can be used for events and also forms part of a route connecting the royal palace’s outdoor spaces with a garden leading towards the waterfront promenade. 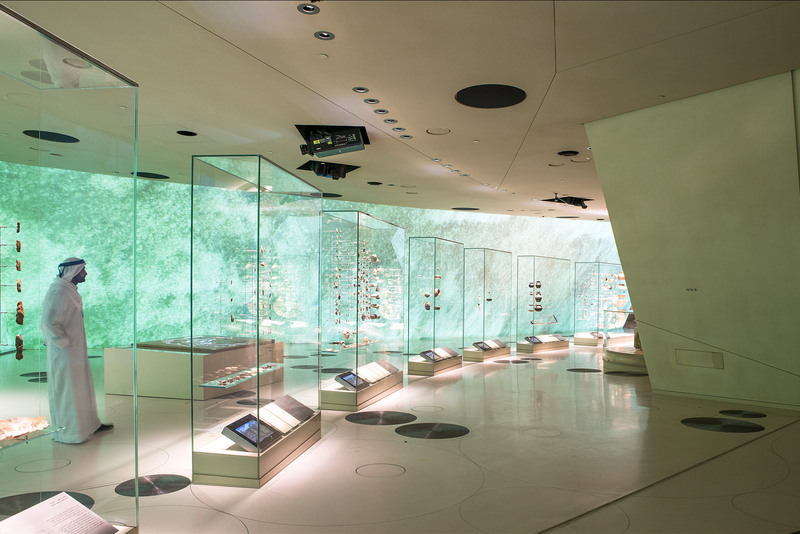 The visitor route extends around one mile and chronicles the history of Qatar, beginning with the period before humans inhabited the peninsula and continuing up to the present day. Several level changes are incorporated along the route, which begins on the upper floor above the entrance foyer and sweeps back down to the level of the historic palace. 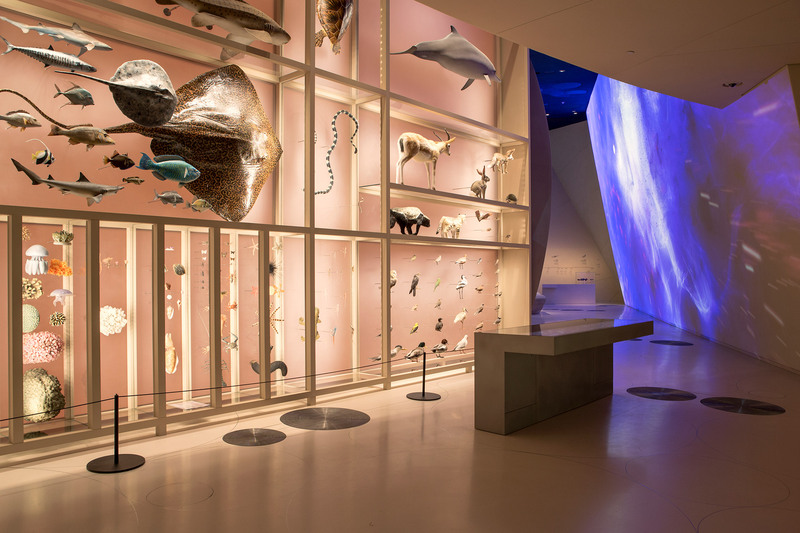 The architecture studio worked closely with the curators to develop a museography tailored to spaces where many of the floors are inclined and there is a complete lack of vertical surfaces. Several of the jutting internal planes are used as a backdrop for bespoke films that depict different aspects of Qatar and its history. 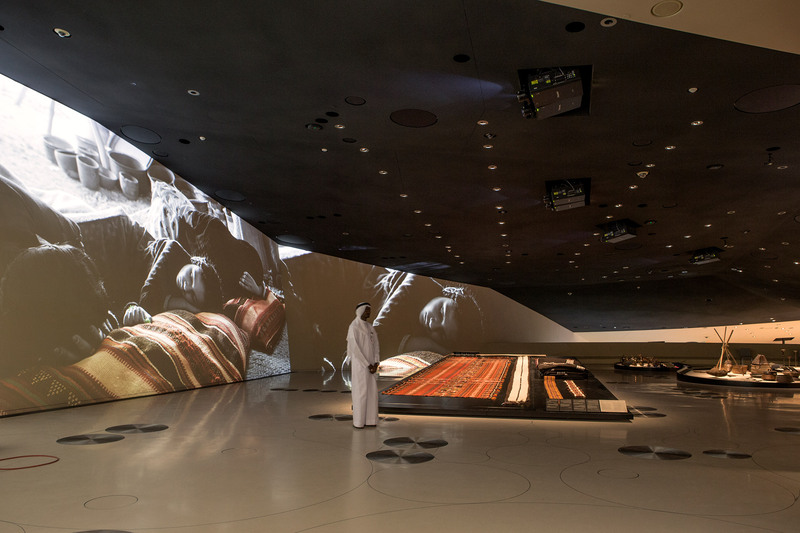 The movie projections, which were produced in collaboration with the Doha Film Institute, are formatted to fit the specific proportions of the walls they are screened on. 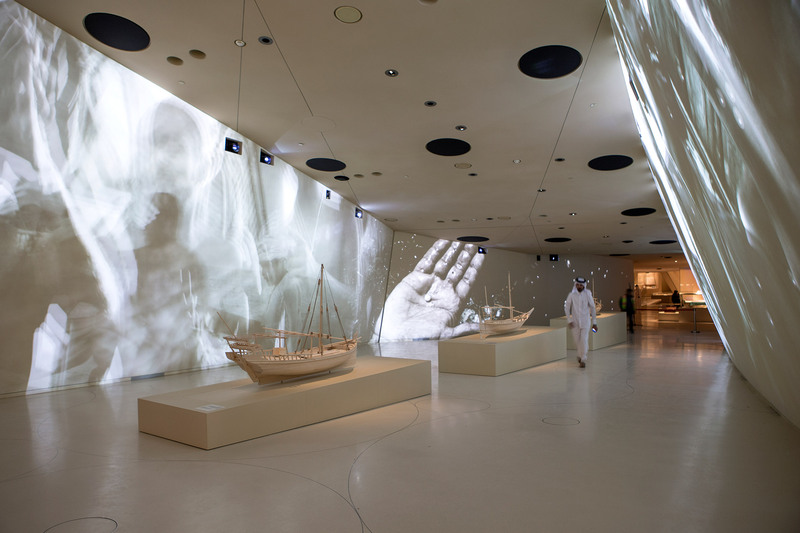 The poetic images displayed on the walls complement the other exhibits and are accompanied by a soundscape that immerses the visitor in a variety of settings ranging from the underwater environment of the sea surrounding Qatar, to the bustling market towns that thrived during the period when the country was central to the pearling industry. 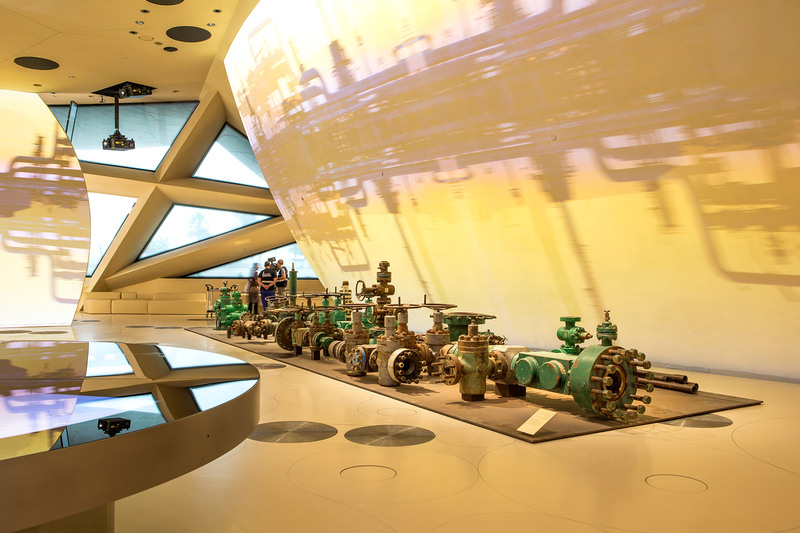 The chronological journey is completed by galleries presenting the modern history of Qatar, including the transformative impact of the discoveries of oil and gas during the latter part of the twentieth century. Finally, visitors emerge from Nouvel’s building into the historic Palace of Sheikh Abdullah bin Jassim Al Thani. This important national landmark was both the family home and seat of government before being occupied by the museum’s predecessor between 1975 and 1996. The museum is surrounded by a landscaped 112,000-square-metre park designed by landscape architect Michel Desvignes. The gently undulating gardens feature native plants and trees intended to represent the land and history of Qatar. Jean Nouvel is a French architect and the 2008 laureate of the annual Pritzker Prize. 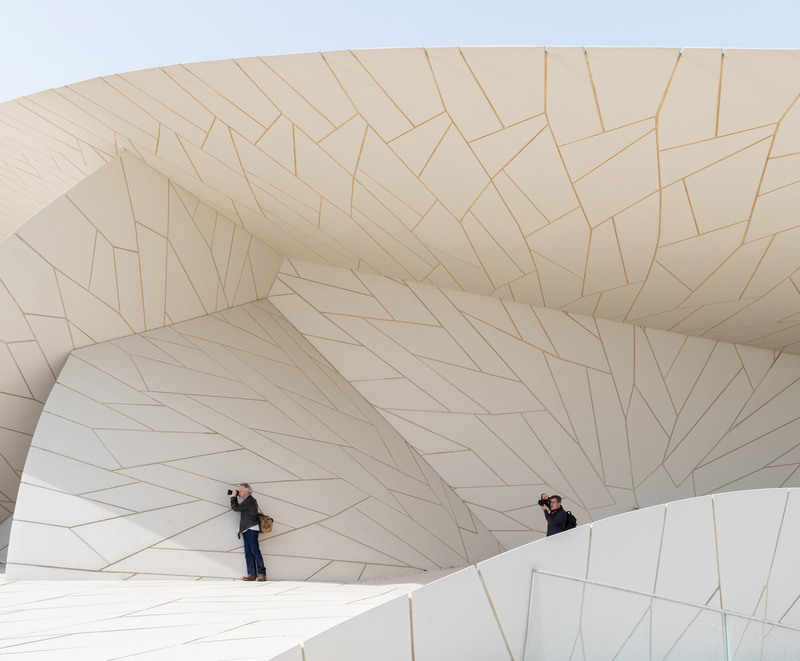 Alongside the National Museum of Qatar, he recently completed the Louvre Abu Dhabi, another large museum in the Middle East that is spanned by a huge geometric-patterned dome. The country of Qatar is currently undergoing preparation for the World Cup in 2022, including the construction of Fenwick Iribarren Architects’ Ras Abu Aboud, a stadium made from modified shipping containers. Other recently completed projects in the country include the Qatar National Library designed by OMA, as well as the Qatar National Archive designed by Allies and Morrison that references traditional coastal watchtowers. 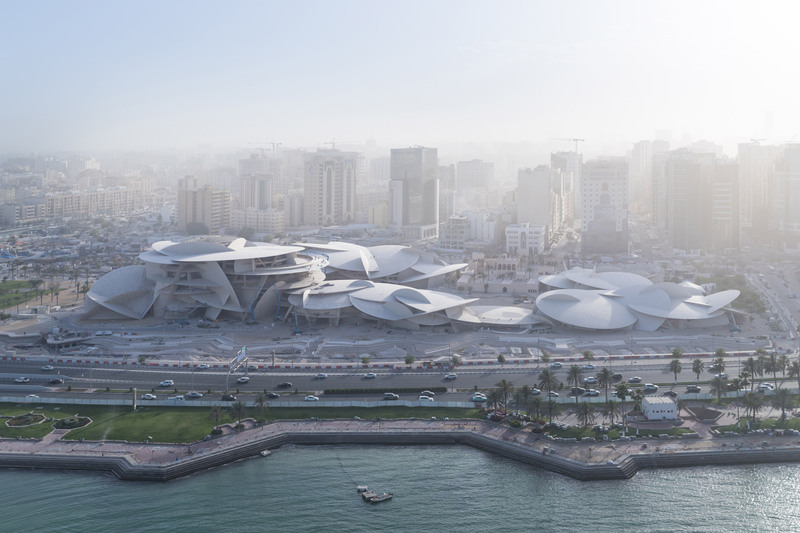 The post Jean Nouvel unveils National Museum of Qatar in Doha appeared first on Dezeen.